Our next release on Roushlabel comes from the increasingly popular Bassel Darwish. The Distance Music frontman has amassed an impressive amount of high-quality labels on reputable labels over the last few years and his own label is really picking up momentum too. His 'Bring Down' EP consists of two big originals and a remix from Madrid-born producer FreedomB. The title track opens the release with a sophisticated groove. Built around a weighty sub bassline and an undulating beat with a subtle level of vocal presence, it finds itself in amply sufficient vibe building territory and would suit daytime terrace atmospheres perfectly due to it's stripped back and 'easy to move to' approach. Next up, 'Code' takes things up a few gears in the energy department. An uptempo stripped back dancefloor pleaser, carrying with it a rumbling low-end, hooky vocal and finespun melodic presence. Another quintessentially groovy number with more underground intensity, perfectly capable of cranking up the heat in the peak hours of any party. Last but not least, FreedomB's remix of 'Code'. Keeping the focus on the track's ambience, the substituted bassline and clever use of hypnotic effects in the transitional phases give it a completely new identity. Not too dissimilar to the original, but, at the same time presenting standout differences which make for an enjoyable new experience of something that was already highly engaging... clever work from an intelligent creator! 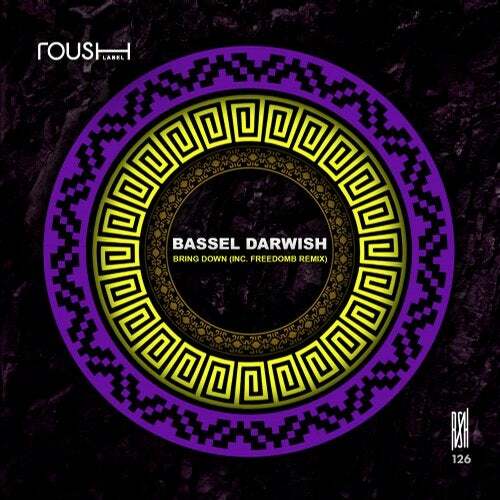 Bassel Darwish's 'Bring Down' EP (Inc. FreedomB Remix) is proudly presented by Roush Label.